If multiple circuit boards are pooled together for processing (structure, vias, surface), it is called a panel or multiplier. This is useful e.g. for small circuit boards, due to reasons of economy and better handling. Also the PCB board assembly and soldering can be simplified by a panelized production. In order to avoid excessive mechanical stress during subsequent separation of the (possibly assembled) PCBs, the contours of the individual circuit boards are provided with scoring notches and / or milled grooves. This separation process is referred to as scoring or milling with bridges to break-out, which can also be combined. If several identical circuits / boards are placed next to each other in the layout, the panel is called a multiplier. With several different circuits, the panel is called mixed multiplier. The maximum processable panel for the manufacturer is called production panel. For cost reasons, all PCBs (also concurrently from different clients), are produced in such a panel. All circuit boards with the same specifications can be placed on such a production panel (e.g. 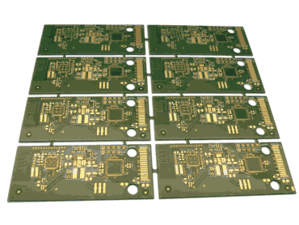 FR4 thickness, trace width, solder mask color). The production panel is separated at the end of the manufacturing process by scoring or milling. A production panel may also contain or correlate with a customer panel.